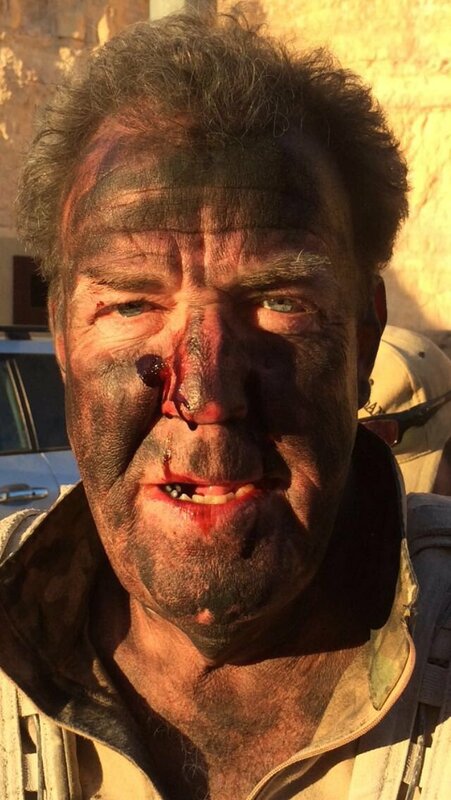 Jeremy Clarkson has shared a picture of his muddied and blackened face on social media, with the caption "I survived the day. Just." He then followed up by tweeting, "My first time in A man [sic]. It hurt, but I liked it." Clarkson has been in Amman, Jordan and had earlier tweeted that he would be doing "the most dangerous stunt" he had ever attempted on Friday. The image of Clarkson's face has been retweeted over 3,500 times and has received more than 16,000 likes. It has prompted speculation that it might be part of a publicity stunt for his new Amazon motoring show, or a late April Fools joke. While some social media users expressed their concern for the presenter, others made light of the situation, particularly referencing the incident when he punched a Top Gear producer, leading to him being sacked by the BBC. @jeremyclarkson Did the producer punch back this time? Clarkson's new show, which he will present alongside Richard Hammond and James May, is scheduled for an autumn release date. It will follow the launch of the BBC's revampedTop Gear in May, with Chris Evans at the helm.